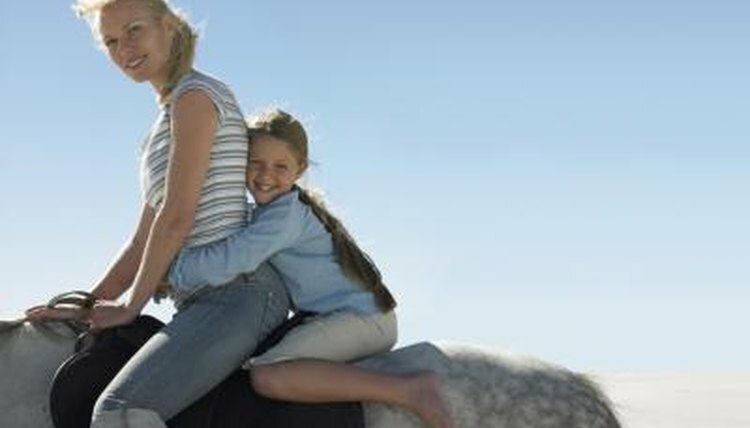 It is difficult to decide what type of horse has the best temperament. Every horse is an individual and every rider has their own unique perspective, as well as their own set of goals, for what they want to accomplish in the saddle. If you're trying to find the horse with the best temperament, you will need to figure out what sort of equine temperament is going to work best for you and your goals. Horse breeds are often labeled as hot blooded, warmblooded or cold blooded. Hot breeds are characterized by their highly responsive, energetic behavior. Hot breeds include Arabians and Thoroughbreds. Hot horses may be spooky or difficult for a novice rider to control. Cold blood breeds of horses are slower, heavily built and generally pretty calm in nature. Cold-blooded breeds include the Clydesdale and other draft breeds. Warmblooded breeds are generally smaller than cold bloods but calmer than the hot breeds. Breeds of warm bloods include the Hanoverian, American Quarter Horse, American Paint Horse, Tennessee Walking Horse and a long list of other common breeds. If you are looking for a calm, forgiving and patient horse look to the American Quarter Horse. This breed has been recognized many times for intelligence, as well as patience and calmness. Paints, Palominos and other breeds that share common lineage with the American Quarter Horse make good choices. Draft breeds are known for having very calm temperaments but they are also extremely large and not as popular for riding as some of the smaller breeds. When you are shopping for a horse, do your research on the breed and see what other equine enthusiasts are saying about their overall temperament. Every horse is a unique individual. Even with a "good-tempered" breed, you will have variations of temperament. The age of an individual horse, his training and his general personality will make a difference in his temperament. When you are shopping for a horse, ask the seller to rate the horse's temperament and explain clearly what you are looking to do with the horse. If you believe a horse is a good match for you, spend time with him and try him out on multiple occasions. Remember that you and the horse must form a bond and a good working relationship. A horse who is ideal for one riding discipline, for example, trail riding or teaching lessons, may lack the drive that is needed for upper level competitions in equestrian sports, such as eventing and reining. You need to choose a horse who has the temperament to be successful in the riding discipline you plan to use him in. A calm, lazy horse may be perfect for a beginner but can hinder an experienced rider in competition. Horse Channel: Hot or Cold: Which Temperament is Best for You? What Is the Difference Between a Warmblood and a Thoroughbred Horse?